Roaming in Florida you might have noticed this popularly tagged ‘Hulk’, marking presence over the streets. We are talking about the Vorsteiner Lamborghini Aventador V LP-700-4 2014; yes the already superfluous Lamborghini gets some enhancements from Vorsteiner and this we have more gorgeous and powerful model than the previous Lamborghini. 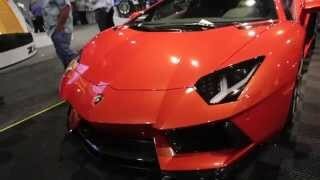 Let us check the Vorsteiner Lamborghini Aventador V LP-700-4 2014 review to know more about it. Vorsteiner in its priority list kept two factors; style and performance while creating Vorsteiner Lamborghini Aventador V LP-700-4 2014. While the locals call it as ‘Hulk’, we would say it as a remarkable amalgamation of three Miami’s finest; Wheels Boutique, Prestige Imports and Lamborghini Miami. We won’t say creating Vorsteiner Lamborghini Aventador V LP-700-4 2014 took complete revision but the changes made contributed impeccably. The list here includes front splitters, the side sill blades, rear diffuser and active zero wing together working to deliver beyond-expectation performance and sportier looks. This entire package gets the contrast with Lamborghini’s gamma radiating Verde Ithica and the OE exterior carbon package which includes PrePreg 2*2 carbon weave. This entire package after being adjoined and encapsulated in the body of Vorsteiner Lamborghini Aventador V LP-700-4, gets aggressive rolling wheels beneath the muscular arches measuring, 20*9 and 21*12.5 ADV.1 featuring Gloss Black finishing. Beneath the hood of Vorsteiner Lamborghini Aventador V LP-700-4 2014 sits a massive 6.5 liter V12 engine generating total output of 740 hp and peak torque of 735 nm paired to seven-speed dual clutch automatic transmission. This All wheel drive model with its enthralling power is capable of hitting the 60 mph from standstill in just 2.8 seconds while the top speed of Vorsteiner Lamborghini Aventador V LP-700-4 2014 touches the mark of 220 mph.